KNAC.COM - Reviews - UFO Live In Akron, Ohio With Photos! UFO Live In Akron, Ohio With Photos! British hard-rockers UFO have been recording and touring since 1970, and albums such as Force It (1975), No Heavy Petting (1976), Lights Out (1977) and Obsession (1978) are classics by almost any standard. The culmination of this period of the band, 1979's Strangers in the Night, is also widely considered as one of the greatest live recordings of the genre. Factor in three additional decades of musical activity, and what fan wouldn't want to check out this legendary band in concert? This particular tour appears to be a one-off run of October dates in the United States and Canada, possibly the last in support of 2012's Seven Deadly. The Fabulous Miss Wendy was the opener, and is scheduled to appear on a few more selected dates. I thought that her all-female punk rock trio was an unusual pairing with UFO, but the audience seemed to enjoy her set. UFO's current lineup includes vocalist and founding member Phil Mogg, with longtime collaborators Andy Parker (drums) and Paul Raymond (guitar and keyboards) - both with history that reaches back to UFO's 1970s peak. 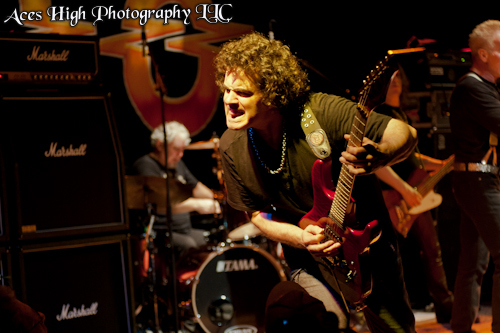 The band is rounded out by Vinnie Moore (guitar, 2003-present) and touring bassist Rob De Luca (2008 - present). I have seen UFO several times in this incarnation, and as expected, they delivered a well-executed performance of seminal melodic hard rock to the capacity crowd. It's hard not to appreciate their high-energy rock and ballads, both incorporating memorable guitar riffs, solos and vocal melodies. UFO's largely mid-tempo style comes across particularly well in a live setting because there is space for all of the parts to breathe. The music was further enhanced by a pristine mix at a comfortable volume (in other words, no ringing ears); the sound support was marred only by some intermittent feedback and persistent and annoying clicking/popping in time with the bass drum. Perhaps a misfiring drum trigger? Like fellow veterans SAXON, UFO has continued to release new music on a regular basis throughout their career. Their set focused on many of the expected classics (see set list), in addition to songs from 2012's Seven Deadly, 2004's You Are Here, and 1995's Walk on Water. While there were quite a few personal favorites missing, it was a well-paced concert and all of the material fit together seamlessly. A few of the tunes also featured extended guitar and keyboard solos, but they never came across as boring or indulgent. Phil Mogg looks and sounds a little diminished at 65, although on this particular night his voice did show some signs of fatigue and wear around the edges; more than I have heard in the past. But like a true pro, he never sang anything that he couldn't hit, opting rather to change the melodies around when necessary. His stage persona is reserved, but he delivers his unique and personal lyrics with feeling. Phil also keeps things moving between songs with a healthy dose of dry British wit. One of his best quips came after he removed his jacket and said (paraphrased), "Yes, I'm stripping down. You're about to see eight inches of English talent. Of course, that takes shrinkage into account." He slid in another good line after a beer break when he deadpanned, "Excuse me for the silence; one needs to refresh the system, you know." 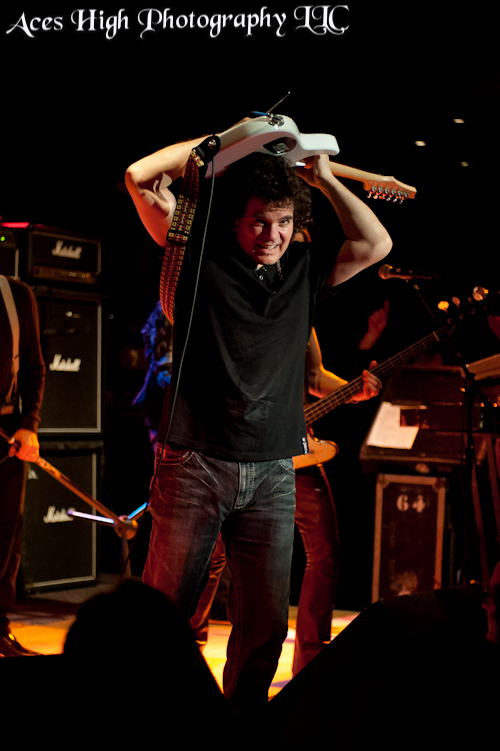 Vinnie Moore first came to prominence in the 1980s as a neoclassical instrumental guitarist on Shrapnel Records. His high-tech chops remain intact, but he also exhibits a jazz/blues vibe in his playing that matches well with UFO's material. Michael Schenker was one of his early influences, and I think that this lends an air of authenticity and respect to his interpretation of Michael's work. Personally, I don't think anyone could do a much better job than he has in his ten years with the band. He played all of the rhythm parts and key solos/melodies accurately and faithfully (many of which are harder than they seem), but is far from a clone. As mentioned earlier, Vinnie really stretched out and displayed some tasteful guitar wizardry during extended solos, most notably on "Rock Bottom". He also provided crisp acoustic guitar work on tunes such as "Baby Blue" and "Venus". Drummer Andy Parker provided a consistently solid rhythmic foundation. Paul Raymond shined as the go-to-guy, deftly juggling rhythm guitar, lead harmonies, keyboards and backup vocals. Rob De Luca opted to use a Thunderbird bass (just like original bassist Pete Way); while no one would confuse the two, his sound and approach fit seamlessly into the band. Throughout the course of the evening, I had casual conversations with attendees from Pittsburgh, as well as Columbus and Cleveland. Similar to previous UFO shows, their fanbase is diehard and - likely due to their 1970s roots - a bit more mature. For example, a gentleman (I believe that his name was Walter) proudly stated, "I'm 66 years old, and I saw UFO back in their heyday in 1976-77." I find this kind of dedication noteworthy in today's climate of fickle music consumers. Will the rock and pop stars of today survive for 40 years? If so, will they have an audience? Interesting thought, isn't it? In summary, it was a great night of classy and well-played hard rock courtesy of one of the genre's originals. If you have a chance to catch UFO near you this October, don't hesitate; it will be well worth your time and money. "Only You Can Rock Me"
Check out some more pics from the show!